Anyone arriving here in Pittsburgh with the mistaken impression that the pejorative term Rust Belt remains an appropriate description (as I did yesterday) is quickly going to receive a much-needed, extremely positive update—particularly after attending the first day of the 2018 EntreEd Forum. And we’re likely to be spreading the word to teacher-trainer-learners everywhere that Pittsburgh and EntreEd (the National Consortium for Entrepreneurship Education), an organization dedicated to “providing [entrepreneurship] advocacy, leadership, networking, technical assistance, and resources nationally for students and teachers,” are well worth emulating as we seek innovative learning models preparing our youngest learners for the quickly evolving work environments they will soon be occupying. Fresh off a flight from San Francisco late yesterday afternoon, I was with EntreEd colleagues for a reception in Pittsburgh’s architecturally rich urban landscape for initial conversations about how teachers, learners, and representatives of a variety of organizations are collaborating to address concerns similar to what I’ve seen Jonathan Nalder and others from FutureWe address—including the overarching challenge of helping students develop the skills they will need for the next decade or two to thrive in an environment where nearly half the jobs currently existing may disappear. One answer, integral to the work EntreEd and Forum attendees are doing, is to recognize the growing importance of entrepreneurship and to help learners develop entrepreneurial skills early and throughout their years in school. The efforts and results are encouraging. Dozens of Pennsylvania students were onsite this morning to participate in a student entrepreneurship showcase—an opportunity for them to show Forum participants what they are doing through entrepreneurship-based curriculum in school and library makerspaces and fab labs (fabrication laboratories). The Productive Panthers from the Austin Area School District, for example, were discussing, displaying, and selling scented soy wax melts they designed and produced with school equipment including 3D printers in the school library. 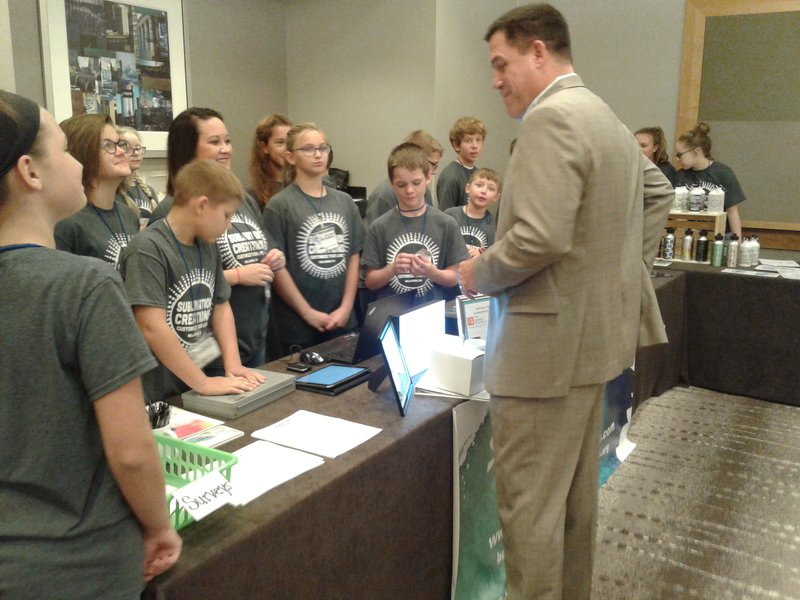 Students from the Bellwood-Antis School District displayed products they produced through their school-based Sublimation Creations business. Talking with them and students involved in several other wonderful entrepreneurial endeavors shows a depth and level of sophistication that those long out of school may not even suspect exists. Ranging in age from elementary school to high-school level, they eloquently—and enthusiastically—described how the embedding of entrepreneurial education and project-based learning is preparing them to thrive in the workforces they expect to enter. They acknowledged the importance of learning how to start a business; design, create, fabricate, and market products; and develop the communication skills needed to sell those products—skills clearly and impressively on display as teachers from throughout the Appalachian region became those students’ customers during the showcase. Collaboration was a theme—if not the theme—never far from the surface during the showcase; a keynote address on entrepreneurship in learning by Gregg Behr, executive director of The Grable Foundation and co-chair of the Remake Learning Council; and during afternoon EntreCamp sessions designed to provide opportunities for Forum participants to share success stories and resources with their peers so those stories could be adapted and implemented back at home within their own communities. Collaboration was clearly a factor in the success of the Productive Panthers and Sublimation Creations efforts since both benefitted from support from the San Diego-based Real World Scholars program. Collaboration between Real World Scholars and The Grable Foundation was also obvious to anyone who noticed, on the Real World Scholars website, that the Foundation is one of RWS’s sponsors. And the obvious collaboration between the students and their teachers remains a very encouraging example of what is right in today’s world of education—as opposed to the often-justified complaints so often voiced by those concerned by the disconnect that exists between school and work. “The entrepreneurial mindset needs to be cultivated…it’s not a one-and-done endeavor,” one EntreCamp colleague said as the first day of the Forum was drawing to a close. It’s inspiring to be here with so many first-rate educators committed to fostering that mindset—and important that we remember that each of us has a role to play in cultivating that mindset, among the learners we serve, to the benefit of the communities in which we work, live, and play.